Sometimes known as a scaffold piercing, an industrial piercing is one eye-catching way to show off your body jewellery. 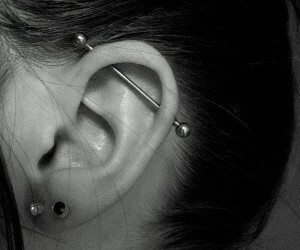 This kind of piercing is actually two helix piercings joined by a stylish long barbell. Guaranteed to give you a real edge to your style, if you've not yet considered an industrial piercing, now's definitely the time! Generally speaking, an industrial or scaffold piercing refers to two helix piercings: an anti-helix piercing, which is made in the cartilage closer to the head, and a helix piercing, which is made in the outer-most part of the ear's cartilage. The piercings form a neat diagonal straight across the ear, and can then be joined by a fantastic piece of body jewelry. That said, it is also possible to get the piercing made vertically if you'd prefer. Often a straight barbell is used for this kind of piercing, though once the wound has healed, you've got endless options available when it comes to the jewellery available. This is one piercing which really exhibits the piercer's skill. Once both piercings have been made, it is possible to use two captive bead rings rather than going for the straight barbell for the initial piece of jewellery. Although using two CBRs should result in a faster healing process, the whole idea behind the industrial piercing is that it will be joined - meaning it's important for the piercings to be correctly aligned, healing at slight angles so that it's easy for you to change your jewellery later on. This is best achieved when just one straight barbell is in place directly after the piercing. Given the complexity of this piercing, the aftercare is a little trickier than with most ear piercings. Over the course of the first month, you'll need to clean your piercing at least four times per day in order to prevent infection. You can reduce the frequency after about 5 months, though care should still be taken to keep the area as clean as possible. It's important for you not to use cotton balls when you're cleaning this area, as they can easily get caught up in the piercing. Instead, make sure you have a cotton swab to hand. It could take up to a year before the piercing is fully healed, but you can get shopping for new jewellery straight away! And this is where it gets exciting! An industrial piercing can be made to look pretty edgy, but that's not to say it can't be feminine too. Not just limited to straight barbells, you can find jewellery enhanced with delicate filigree hearts, pendant crosses or even butterflies. For a more subtle look, think about shaped bars - spiral designs in sheek black are a great option if you're aiming for a sophisticated look with that something extra. The only important thing to remember when browsing for your next aquisition is that it has to be long enough for your piercing - anything which is too short will be painful in the long term, so do check the length with extra care.